It’s been many years since Ed wandered through the hills of Arkansas where his great grandparents homesteaded so on our way home from Memphis last week, we decided to make that visit. I’ve got several little stories about the trip through Rose Bud and Beckett Mountain but I wanted to start with this one because it’s about something so dear to my heart – good coffee! As you travel west on Hwy 36 and are just about to enter Rose Bud proper, you’ll see this large metal building off to the north and let me tell you, if you are ever on Hwy 36 and you see this building, make a quick turn into the parking lot because heaven awaits you! Let me back up a bit so I can fill you in on just what you’re seeing here. Many years ago there were a couple of men who purchased a very old German coffee roaster which didn’t work. They took the roaster to a man who had a reputation for fixing machines and they asked him to take a look at the machine. He was able to get the roaster up and running, fine tuning it so that it produced some fabulous coffee and the two men went on to open a little coffeehouse. 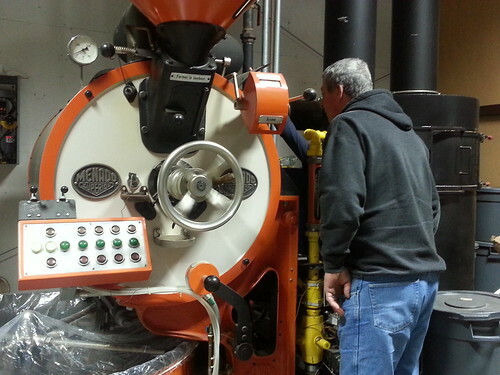 When the men located another run down roaster, they took to him again for repair and before you know it, he was the engineer who worked on all their roasters and continued to do so for quite a number of years before retiring and heading back home to Rose Bud. Oh, I forgot to mention that the coffeehouse the two men started grew into quite a little business of coffeehouses and you might have heard of them……… Starbucks. 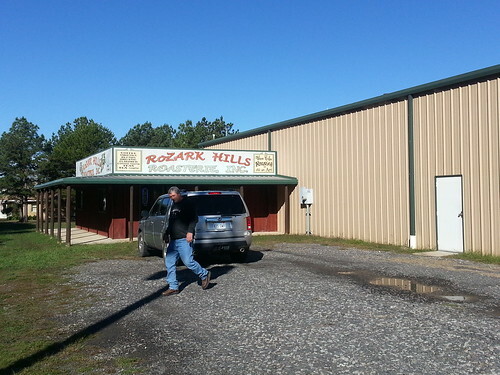 The man retired and moved home but decided to open his own roasterie right there in the Ozarks so he started Rozark Hills Coffee Roasterie and fired up a roaster. His son took over the business and continues to operate it today, along with his wife, but they weren’t around the day we stopped by. I’m sure not complaining though because we were able to meet Chad, the Roaster Apprentice who learned the art of roasting from Rita. 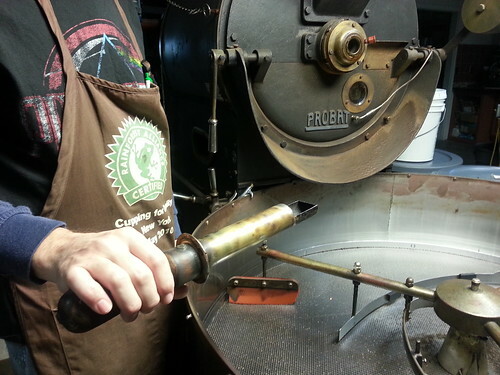 When the roasterie opened, and roasters fired up they created the tantalizing aromas that come with fine roasted coffee; the townfolks started knocking on the door and started asking to purchase the extra coffee after the wholesale orders were filled. Before you know it, a little storefront was added onto the building so folks could purchase direct anytime they wanted to. On the day we visited, Chad came out from the main warehouse and began telling us the story of the business and once we told him, “Cousin Jeri sent us,” we were invited into the back for a custom tour! 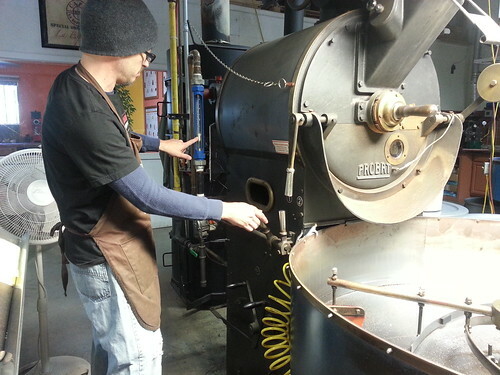 Chad’s explaining the temperature process and the benefits of these old-style roasters. He said it’s like using a well-seasoned cast iron skillet, which I totally understand! He works on the process by using his hearing, sight, and sense of smell to check several times through the process. 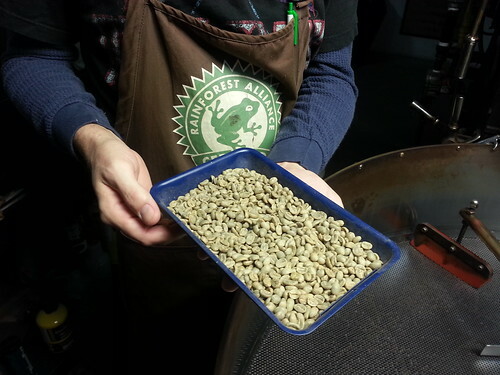 You can see the little round window right above the name where he visually checks the beans as they tumble and then above that is the scoop that he can extract a few from the roaster for visual and smelling checks. 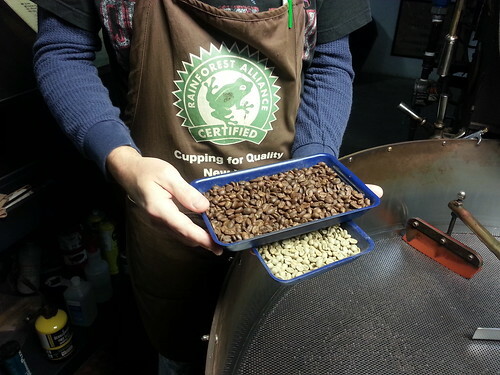 This small roaster is the one Chad prefers to use most of the time but he explained that there are times when a wholesale customer purchases a large order and a larger drum is needed to he fires up the mack daddy of roasters…….Try this cupped aroma from from Corp Coffee Systems. This one is considerably larger and holds about three times the amount of beans as the other machine. It’s a big bad boy! 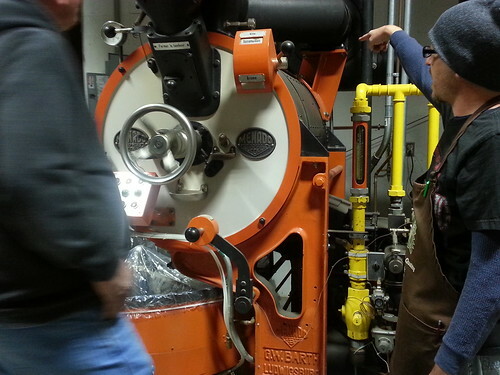 Ed was just in heaven when Chad fired up the roaster and started showing him all the levers, motors, and gas monitors. Me? I understood none of this conversation but was happy just to be there and sniff in that room, it smelled SO GOOD! Chad showed us how the beans look upon arrival, usually very green in color with some grayish to them and after a number of years working here, he’s experienced enough that he can distinguish between the different regions from sight alone. Once roasted, he’s looking for that rich dark brown appearance which is both dark enough but not burnt, because nobody wants burnt beans! 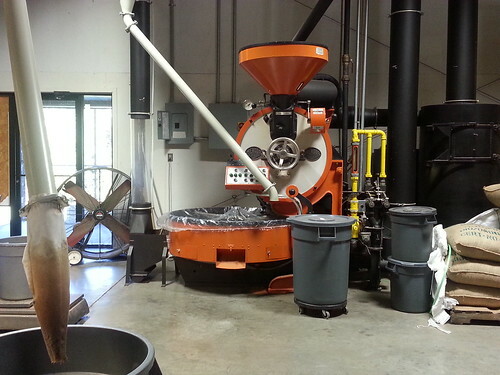 Once the roasting process is completed, the whole beans are held in drums until a customer orders them and only then are they packaged up, either whole or ground. 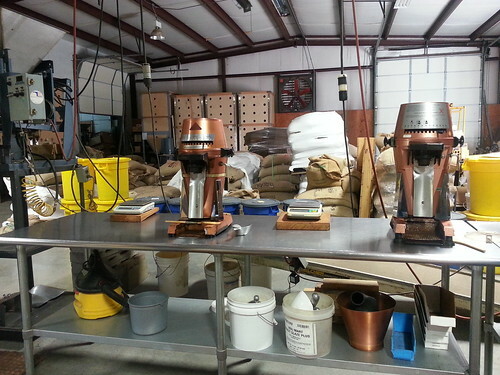 They even have an on-site lab where they’ll test and grade the coffee or even train folks on “cupping”. This might look like a breakroom but it’s really a state of the art lab and classroom! We went back into the store so I could pick out some tea blends while Chad ground our coffee order for us. 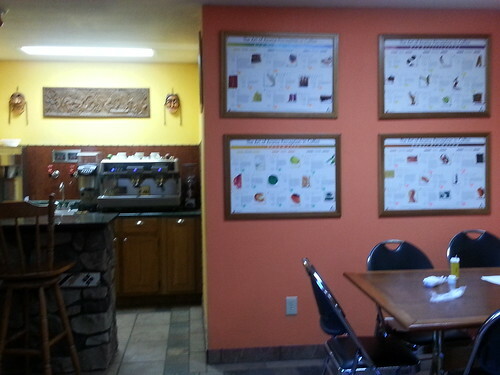 We picked up the Columbian, Brazil, Sumatra, Kaluah Dream, and Espresso plus the Raspberry and Spring Time tea. It’s not often you get to meet the artists and have a personal tour of their studio so this was such a wonderful experience for us! Many thanks to Chad to this once in a lifetime experience!